With the aim to ensure that digital business activities are taxed in the country of the user, Member States are now starting to seek unilateral solutions how to capture business models that can make profit from digital services in a country without being physically present. Slovakia is doing the same; starting from 1 January 2018 the definition of permanent establishment is broader and thus, profits of foreign operators arising from Slovakia from certain digital activities are taxable. Reflecting this trend and in an effort to ensure a coordinated approach to taxation of digital economy at Union level, the European Commission proposed new rules in that matter recently. To become law, the proposals must be adopted by the Council by unanimity. Below is a brief summary of the most important information. 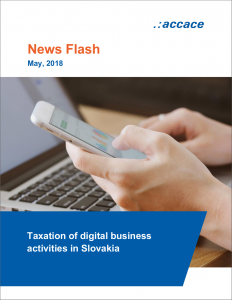 As we have already informed you in our News Flash, Slovakia, with the aim to address the challenges of taxing modern digital business activities, introduced with effect from 1 January 2018 the broader local definition of permanent establishment. Recurring services of mediation of transport and accommodation even if they are performed through a digital platform are considered as activities carried on through a permanent place in the territory of the Slovak Republic and thus, lead to creation of a permanent establishment. Foreign operators of such digital platforms are obliged to register in Slovakia for income tax purposes. According to the publicly available rulings of the Slovak Ministry of Finance, operators of digital platforms create permanent establishment in Slovakia with no regard to the fact if they come from state with which Slovakia has double taxation treaty, or from states that Slovakia does not have double taxation treaty with. In the case the tax registration obligation is not fulfilled, the payments for mediation services shall be subject to a withholding tax. Member States are now starting to seek fast, unilateral solutions to tax digital activities, which creates a legal and tax uncertainty for business. With the aim to ensure that the digital economy is taxed in a fair, growth-friendly and sustainable way, a coordinated approach is proposed at Union level. Recently, the European Commission proposed new rules to ensure that digital business activities are taxed in a fair and growth-friendly way in the EU. The proposed rules should be, if approved implemented by the Member States by the end of the year 2019. This proposal would enable Member States to tax profits that are generated in their territory, even if a company does not have a physical presence there. The new rules would ensure that online businesses contribute to public finances at the same level as traditional ‘brick-and-mortar’ companies. This interim tax should ensure that those activities, which are currently not effectively taxed would begin to generate immediate revenues for Member States. This indirect tax would apply to revenues created from certain digital activities, which escape the current tax framework entirely. This system will apply only as an interim measure, until the comprehensive reform has been implemented and has inbuilt mechanisms to alleviate the possibility of double taxation. created from the sale of data generated from user-provided information.